After years of iterations, we’re proud to present you our roleplaying game, the Gatekeepers. 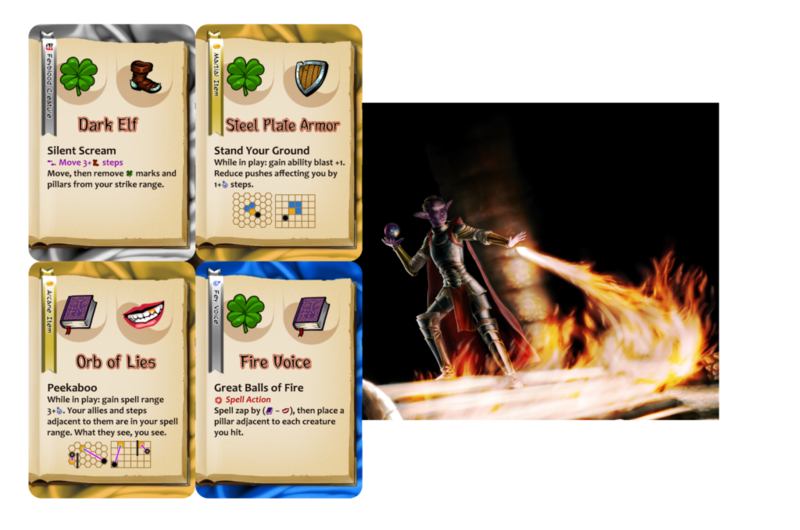 At the heart of Gatekeepers is a simple game mechanic. Roll two six-sided dice, add your icons. If you beat a number the game master tells you, you succeed. Otherwise, complications and failures drive the story forward. There are two icons on each of your cards, and different icons are used for different things: swords are a symbol of might and courage (and breaking furniture over people’s heads), smiles are a symbol of flair and confidence, used for bluffing and dramatic entrances. Every time the narrative comes at a crossroads, the game master will ask you to make a test: two kinds of icons are relevant to it and the number to beat varies based on the cards you have and the task at hand. There are no character sheets in Gatekeepers. 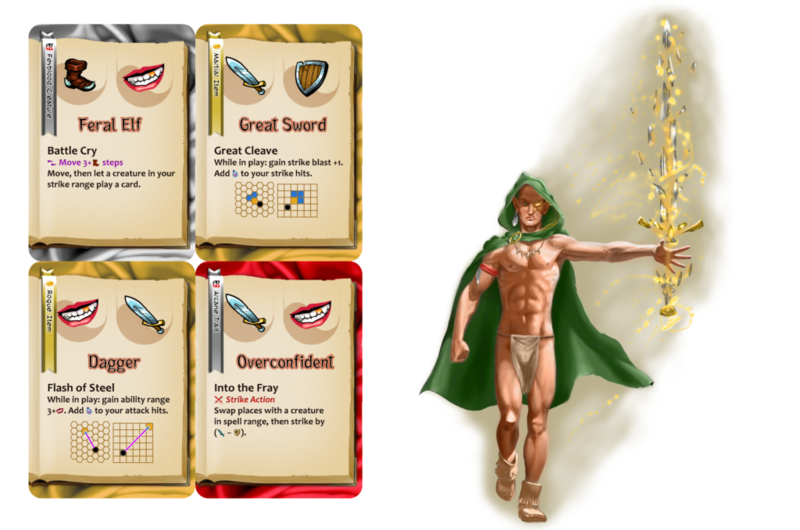 We use cards and tokens to keep track of character development, resources and wounds. The math is deliberately simple so we can keep our tactical engagements clever and magical. 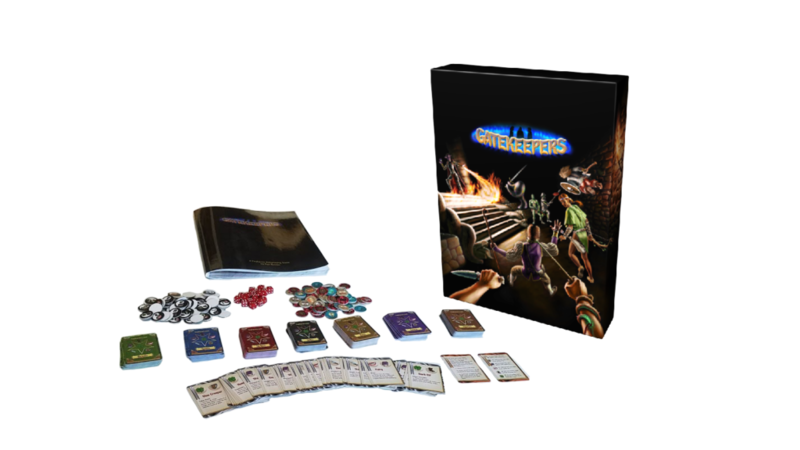 Gatekeepers is a rules-light narrative-focused game with deep strategic gameplay. Because why wouldn’t you want to be a Dragon, a Giant Mantis or a Goopy Blob? In alphabetical order: City Elves, Dark Elves, Demons, Dragons, Dwarves, Fairies, Feral Elves, Giant Mantises, Gnomes, Goblins, Goopy Blobs, Humans, Kobolds, Orks, Trolls, Vine Creepers and Watchers. The idea of Gatekeepers came out of sheer laziness. Writing is hard, gaming is easy, and writing things down is the worst. We’ve thought long and hard on how to make the game master’s job easier. After years of iterations we’ve arrived at this rule set. To borrow computer game terminology, there are two kinds of lag we reduced: prep lag and dice lag. “Prep lag” is all the motions the game master goes through from the moment an adventure idea enters her head to where the players get to experience it. “Dice lag” is how long it takes for a player to take a turn once they’ve decided on what to do. Dice lag also happens when the game master has a lot of NPCs on the table and they “take forever” to take their turns. A lot of work went into streamlining this, so the game can run quickly with entire armies on the table. The other design goal that was important to us is to keep our game a fair game. The game master should have fun too! Turns out that when the game master doesn’t need to fudge the dice and worry about providing too much challenge or not enough challenge, he can think about better things in life, like feisty come backs and tactics. Most encounters are asymmetrical: the player characters are powerful and flexible, but few in number; their enemies are numerous, but as predictable as chess pieces. 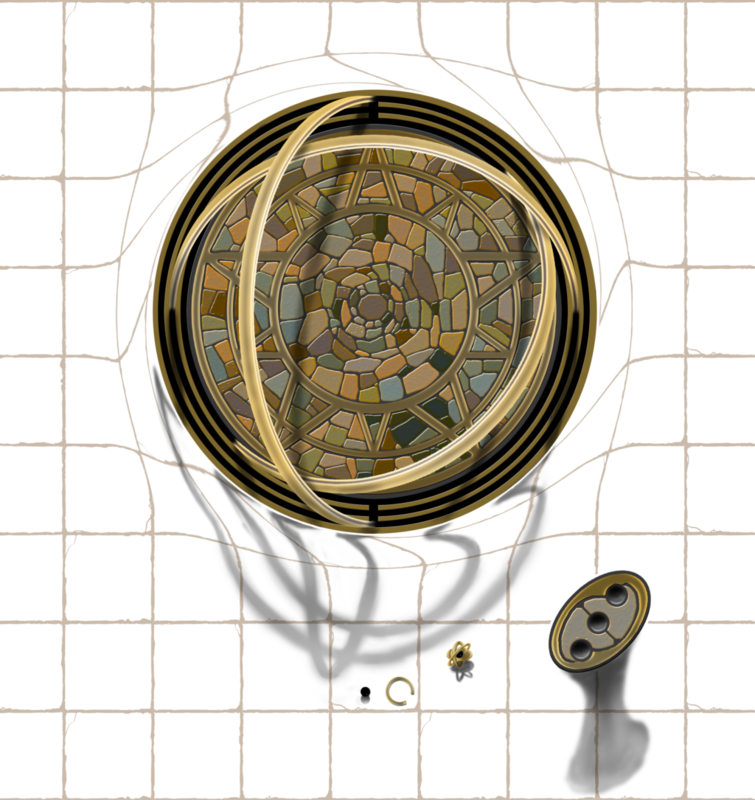 The players work together to overcome combat encounters that play out like puzzles. In its current iteration, the game is easy to run, easy to get into, and is rewarding to master. Want to know more? Read this free 23-page PDF, the sample of our rule book containing the character creation, basic dice resolution mechanic and the combat system. Almost no prep: the game master does not need to spend an evening before the game to have a game. You start with an idea and you’re ready to play. If a fight breaks out, opponents of appropriate difficulty are created in seconds. Cheat-free gaming: the game master does not fudge anything. The challenge is real, but fair. The game has no game master screen, so the players can plan their teamwork around what their enemies can do. We use cards and tokens to keep the math dirt simple and to keep a level playing field. One of the dilemmas we’ve solved with our approach is stealth. Given our goal of a cheat-free gaming, how can one have a “fair” stealth system, where the game master does not know where you are? Instead, we have a hide and reveal system that’s used by both players and non-player characters. When a creature hides, they put some tokens on the table, where they “could be”. Nobody knows where they are until someone goes looking for them, stepping on each token to flip it over. When that happens, there is a chance that the hidden character is revealed to be nearby (the token needs to match a randomly drawn token) and is placed back on the board by the player who controls them. If not, keep looking. If the hidden character’s next turn comes up and nobody has found them, they appear next to any of the remaining tokens. It’s quantum physics stealth without the math or extra dice rolls. Example: Sir Viney the Vine Creeper is surrounded by Dark Elf mercenaries. Sir Viney is a Forest Voice, a sorcerer able to shape and control the growth of plants. To give himself and his friends a fighting chance, Sir Viney sprouts forth a wall of vegetation, and with clever positioning, hides the entire party in it. On their turn, Dark Elves can use their Silent Scream ability to quickly find Sir Viney’s friends with echo location, but this ability has limited range. As they close in around the plants, Sir Viney’s mentor, a Demon Assassin, comes out of hiding to strike the first blow. 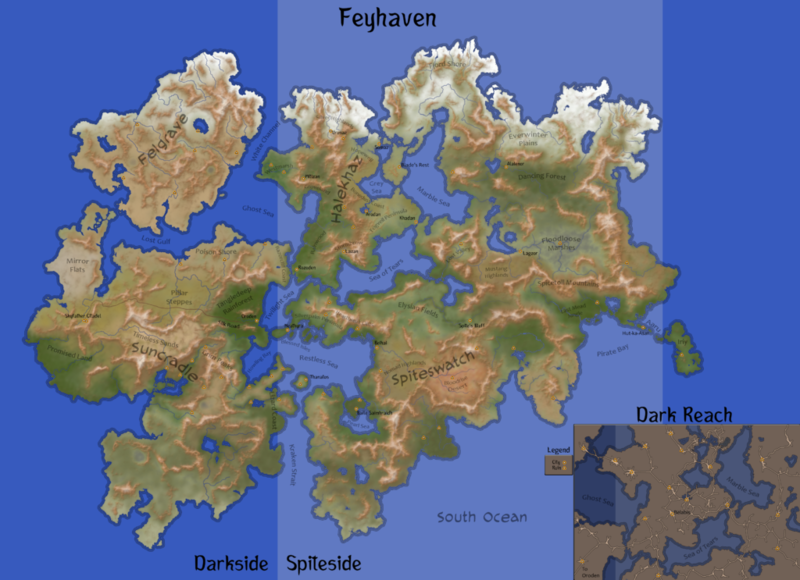 Ask us questions at @Feyhaven on Twitter. Join our community on reddit.